At the end of 2016, International Journal of Bioprinting (IJB) is able to estimate its first mock impact factor. Based on one issue published in 2015, the 2016 mock impact factor for IJB is calculated to be 6, excluding self-citations! This result is surprising, impressive and encouraging. However, this is just a beginning and more and more quality articles and reviews are needed in order to maintain it. Tissue-engineered products commercially available today have been limited to thin avascular tissue such as skin and cartilage. The fabrication of thicker, more complex tissue still eludes scientists today. One reason for this is the lack of effective techniques to incorporate functional vascular networks within thick tissue constructs. Vascular networks provide cells throughout the tissue with adequate oxygen and nutrients; cells located within thick un-vascularized tissue implants eventually die due to oxygen and nutrient deficiency. Vascularization has been identified as one of the key components in the field of tissue engineering. In order to fabricate biomimetic tissue which accurately recapitulates our native tissue environment, in vitro pre-vascularization strategies need to be developed. In this review, we describe various in vitro vascularization techniques developed recently which employ different technologies such as bioprinting, microfluidics, micropatterning, wire molding, and cell sheet engineering. We describe the fabrication process and unique characteristics of each technique, as well as provide our perspective on the future of the field. Synergies in bioprinting are appearing from individual researchers focusing on divergent aspects of the technology. Many are now evolving from simple mono-dimensional operations to model-controlled multi-material, interpenetrating networks using multi-modal deposition techniques. Bioinks are being designed to address numerous critical process parameters. Both the cellular constructs and architectural design for the necessary vascular component in digitally biomanufactured tissue constructs is being addressed. Advances are occurring from the topology of the circuits to the source of the of the biological microvessel components. Instruments monitoring and control of these activates are becoming interconnected. More and higher quality data are being collected and analysis is becoming richer. Information management and model generation is now describing a “process network.” This is promising; more efficient use of both locally and imported raw data supporting accelerated strategic as well as tactical decision making. 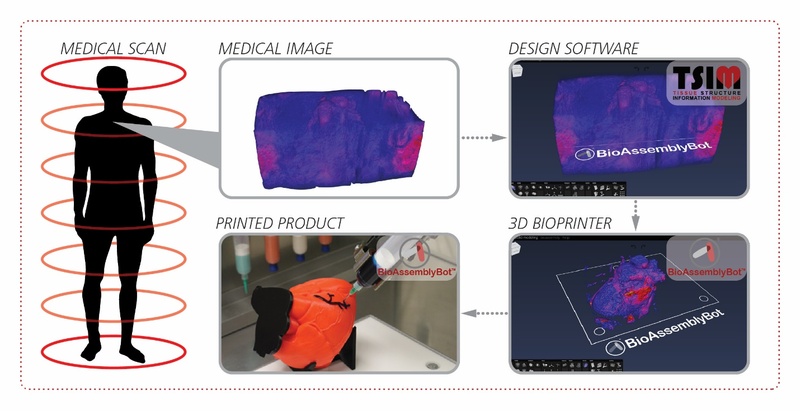 This allows real time optimization of the immediate bioprinting bioprocess based on such high value criteria as instantaneous progress assessment and comparison to previous activities. Finally, operations up- and down-stream of the deposition are being included in a supervisory enterprise control. Three-dimensional (3D) printing in tissue engineering has been studied for the bio mimicry of the structures of human tissues and organs. Now it is being applied to 3D cell printing, which can position cells and biomaterials, such as growth factors, at desired positions in the 3D space. 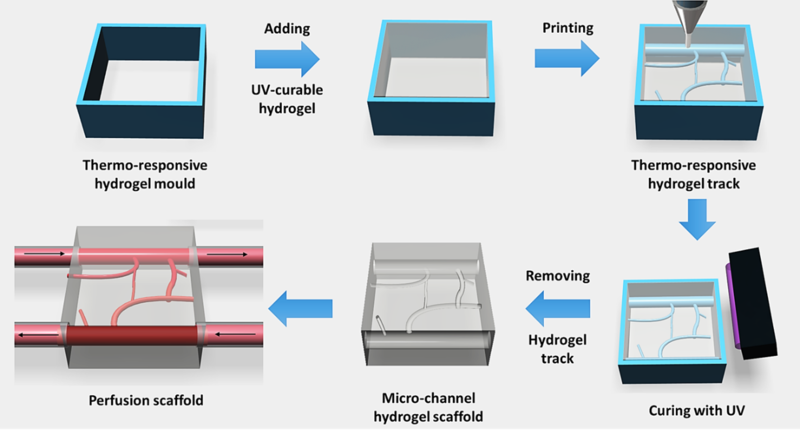 However, there are some challenges of 3D cell printing, such as cell damage during the printing process and the inability to produce a porous 3D shape owing to the embedding of cells in the hydrogel-based printing ink, which should be biocompatible, biodegradable, and non-toxic, etc. Therefore, researchers have been studying ways to balance or enhance the post-print cell viability and the print-ability of 3D cell printing technologies by accommodating several mechanical, electrical, and chemical based systems. In this mini-review, several common 3D cell printing methods and their modified applications are introduced for overcoming deficiencies of the cell printing process. For more than a decade living cells and biomaterials (typically hydrogels) have been printed with laser-assisted bioprinting. Often, a thin metal layer is applied as laser-absorbing material, called dynamic release layer (DRL). This layer is vaporized by focused laser pulses generating vapor pressure that propels forward a coated biomaterial. Different lasers with laser wavelengths from 193 to 1064 nanometer have been used. As a metal DRL gold, silver, or titanium layers have been used. The applied laser pulse durations were usually in the nanosecond range from 1 to 30 ns. In addition, some studies with femtosecond lasers have been published. However, there are no studies on the effect of all these lasers parameters on bioprinting with a metal DRL, comparing different wavelengths and pulse durations – except one study comparing 500 femtosecond pulses with 15 ns pulses. 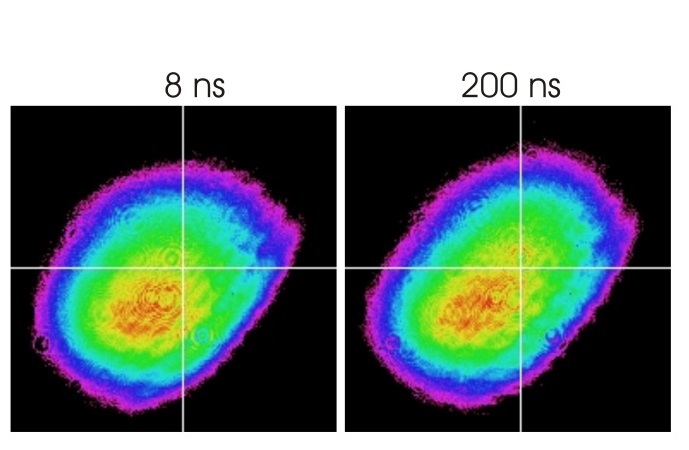 In this paper, the effects of laser wavelength (355, 532, and 1064 nm) and laser pulse duration (in the range of 8 to 200 ns) are investigated. Furthermore, the effects of laser pulse energy, intensity, and focal spot size are studied. The printed droplet volume, hydrogel jet velocity, and cell viability are analyzed. A major limitation of using synthetic scaffolds in tissue engineering applications is insufficient angiogenesis in scaffold interior. Bioactive borate glasses have been shown to promote angiogenesis. There is a need to investigate the biofabrication of polymer composites by incorporating borate glass to increase the angiogenic capacity of the fabricated scaffolds. 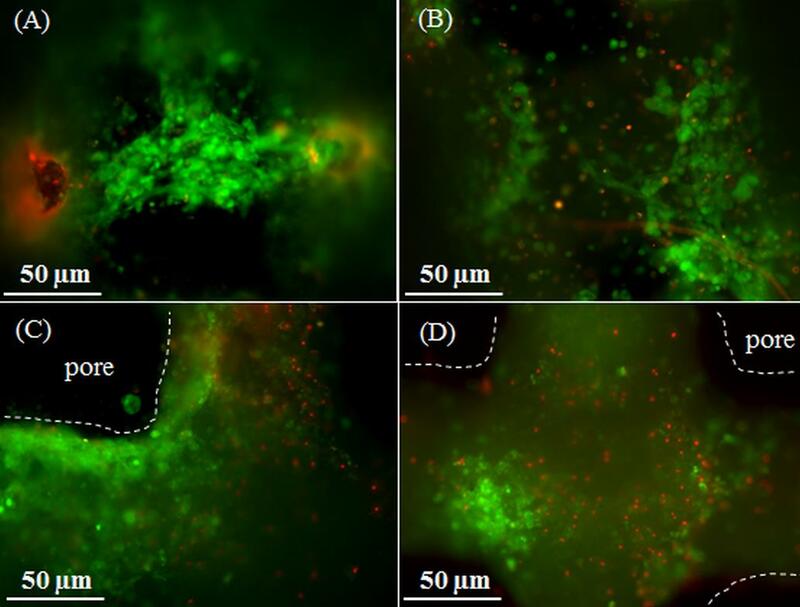 In this study, we investigated the bioprinting of human adipose stem cells (ASCs) with a polycaprolactone (PCL)/bioactive borate glass composite. Borate glass at the concentration of 10 to 50 weight %, was added to a mixture of PCL and organic solvent to make an extrudable paste. ASCs suspended in Matrigel were ejected as droplets using a second syringe. Scaffolds measuring 10x10x1 mm3 in overall dimensions with pore sizes ranging from 100 – 300 µm were fabricated. Degradation of the scaffolds in cell culture medium showed a controlled release of bioactive glass for up to two weeks. The viability of ASCs printed on the scaffold was investigated during the same time period. This 3D bioprinting method shows a high potential to create a bioactive, highly angiogenic three-dimensional environment required for complex and dynamic interactions that govern the cell’s behavior in vivo. Tissue engineering approaches have been adopted to address challenges in osteochondral tissue regeneration. 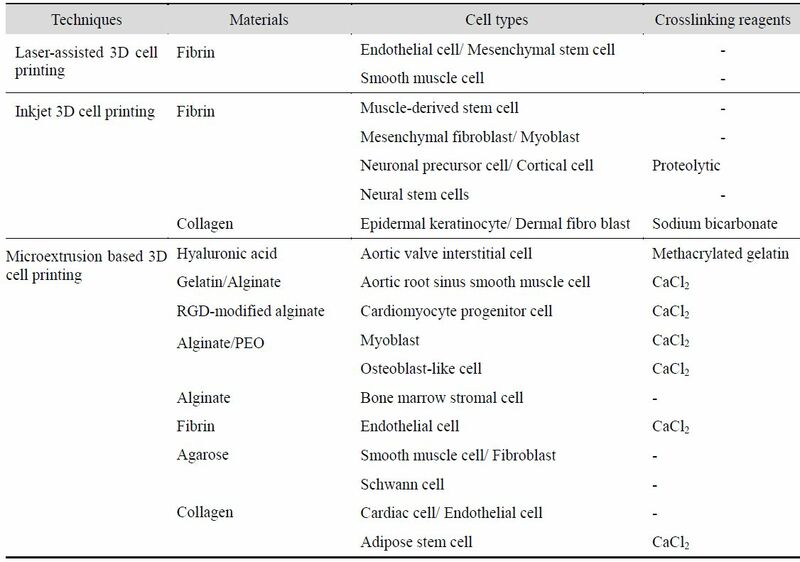 Single phase scaffolds, which consist of only one single material throughout the whole structure, have been used extensively in these tissue engineering approaches. However, a single phase scaffold is insufficient in providing all the properties required for regeneration and repair of osteochondral defects. 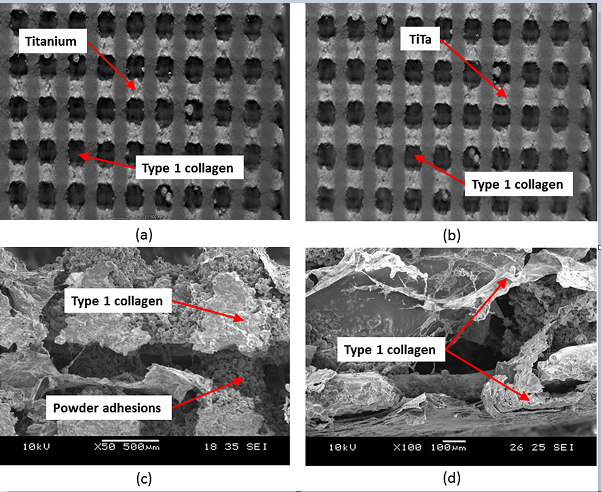 Biphasic scaffolds with two distinct phases of titanium/type 1 collagen and titanium-tantalum/type 1 collagen were developed for the first time using selective laser melting. Observation of the biphasic scaffolds demonstrated continuous interface between the two phases and mechanical characterization of the metallic scaffolds support the feasibility of the newly developed scaffolds for tissue engineering in osteochondral defects. One of the important constituents in tissue engineering is scaffold, which provides structural support and suitable microenvironment for the cell attachment, growth and proliferation. 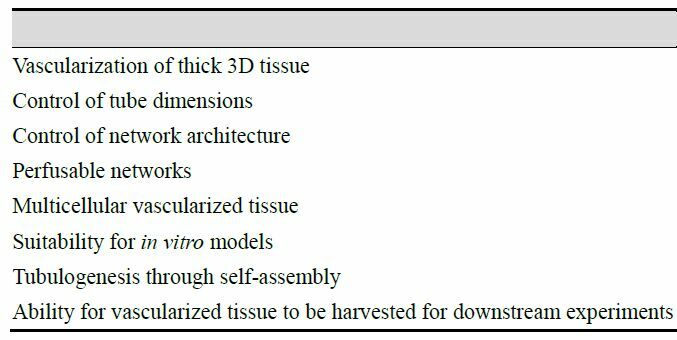 To fabricate micro/nano structures for soft tissue repair and three-dimensional (3D) cell culture, the key is to improve fibre-based scaffold fabrication. Electrohydrodynamic (EHD) jetting is capable of producing and orientating submicron fibres for 3D scaffold fabrication. In this work, an EHD-jetting system was developed to explore the relationship between vital processing parameters and fibre characteristics. In this study, polycaprolactone (PCL) solution prepared by dissolving PCL pellets in acetic acid was used to fabricate the scaffolds. The influence of voltage, motorized stage speed, solution feed rate, and solution concentration on fibre characteristics and scaffold pattern were studied. 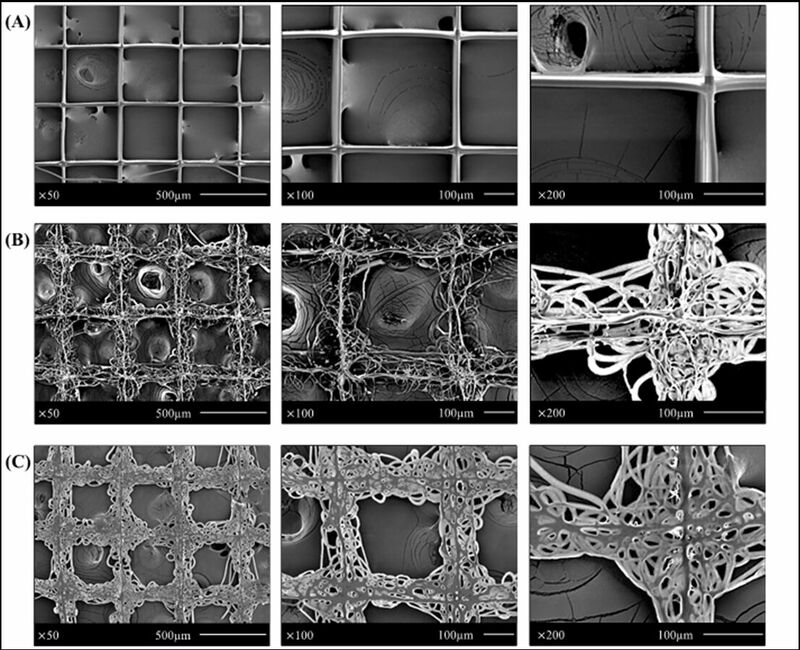 Morphology of the EHD-jetted PCL fibres and scaffolds were analysed using optical microscope images and scanning electron microscope (SEM) images. Multi-layer scaffolds with the varied coiled pattern were fabricated and analysed. Cell attachment and proliferation have to be investigated in the future by further cell culture studies on these multi-layer coiled scaffolds. Bioprinting has been introduced as a new technique in tissue engineering for more than a decade. However, characteristics of bioprinted part are still distinct from native human tissue and organ in terms of both shape fidelity and functionality. Recently, the combination of at least two hydrogels or “multi-materials/multi-nozzles” bioprinting enables simultaneous deposition of both model and support materials, thus advancing the complexity of bioprinted shapes from 2.5D lattice into micro-channeled 3D structure. In this article, a perspective on the roles of second bioinks or support materials is presented and future outlook of sacrificial materials is discussed.